Will Hispanic bilingualism survive in the United States? Around a third of Latinos speak both English and Spanish. But as more Hispanics are born in the U.S., they're less likely to be bilingual. NEW YORK - The Hispanic patient came into the Mount Sinai Beth Israel emergency room in New York with chest pain, and he was slipping in and out of consciousness. But it wasn't just the doctors and nurses by his side - so was Clarimel Vlakančić, 32, a bilingual medical interpreter who grew up in both the U.S. and the Dominican Republic. "I had to keep shouting at him, 'Sir, everything's all right, they're going to do this, they're going to do that,'" she said. "It was quite intense." In the end, doctors were able to stabilize him - with Vlakančić's help. "It's very rewarding when people are like, 'Thank you so much for helping me.' It just makes you feel good." Being bilingual isn't always a matter of life and death, but it is a way of life for millions of Latinos in the U.S. While many predicted that Spanish was never likely to erode the dominance of English in the United States to any significant degree, the number of bilingual speakers keeps growing, even as immigration declines. An estimated 57 million Latinos live in the U.S., and three-quarters of them speak Spanish at home, according to the Pew Research Center. About a third of adult Hispanics are bilingual, speaking the most-used non-English language in the country. By 2055, an estimated 125 million Hispanics will live in the U.S. - the so-called "tipping point" when whites will become a minority. But as immigration slows and the U.S.-born Latino population grows, the number of Hispanics who speak English is on the rise. As more Hispanics are born in the U.S., more young Latinos now speak English. In 2014, Pew found that 88 percent of Latinos ages 5 to 17 speak only English or speak it "very well," an increase from 73 percent in 2000. And while 60 percent of U.S.-born Hispanics speak Spanish at home, that number fell from 66 percent in 2000. "It's this weird paradox: we're getting this large increase in Spanish speakers and the very same time a tremendous decrease in Spanish speakers. The language tends to not get fully transmitted one generation to the next within families," said Phillip M. Carter, assistant professor of linguistics at Florida International University in Miami. The future of bilingualism in the U.S. While the share of Hispanics who speak Spanish at home may have dropped, the overall number of Spanish speakers - about 36.7 million - continues to rise due to the growth in the Hispanic population. But as demographics change, a smaller share of Latinos may speak Spanish in the future. In 2014, 37 percent of Hispanic children and teens lived in English-only households, compared to 30 percent in 2000, according to Pew. "It's unlikely by the time the tipping point happens [in 2055], U.S.-born Latinos will be as proficient in Spanish as they are in English," said Carter. While other immigrant languages have dropped significantly in use, today's Latin American immigrant population is larger than previous foreign-language-speaking groups. "It's a numbers game," said Carter. For example, around 4 million Italians emigrated to the U.S. between the 1880s and 1920s, accounting for about 13 percent of the U.S. immigrant population by 1960. By comparison, more than 19 million Latino immigrants lived in the U.S. in 2014, comprising nearly half of the foreign-born population. "Current demographic trends suggest that we'll continue to see more Hispanics speaking English and fewer speaking Spanish, but that's not to say that Spanish will disappear from homes in the United States," said Jens Manuel Krogstad, a Pew Research Center editor. "We found that bilingualism peaks with the second generation - that is, the children of immigrants. Among Latino children of immigrants, about half say they're bilingual, but when you get to the third generation, that share falls to 23 percent," he added. The size of the Spanish-speaking population will depend on the flow of new immigrants, Korstad explained. Despite a growing number of English-dominant Hispanics, 95 percent of U.S. Latinos believe it's important for future generations to speak Spanish, according to Pew. Monica Olivera, 42, exemplifies what's possible for Hispanics who have been in the U.S. for generations and want to pass down their language skills. The founder of the Mommy Maestra blog for Hispanic families who homeschool bilingual children, Olivera is a sixth-generation American on her mother's side with roots in Mexico, while her father was born in Spain. She married an English-speaking American, and now lives in rural North Carolina with few opportunities to use her language skills. 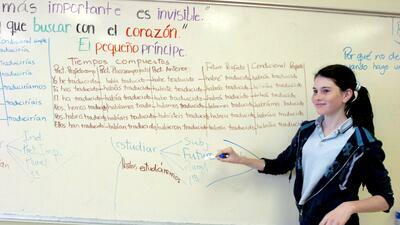 "Even though Spanish was my first language, English became my dominant language," she said. But now, she's teaching her two children, ages 10 and 12, to speak Spanish in order to connect to their roots, communicate with family, and have better economic opportunities when they're older. While consistency in speaking the language at home is challenging, she uses a variety of programs and teaching methods as a part of her children's homeschooling. "I really wanted them to have that gift of language," she said. "Ultimately I want to raise global citizens. I want to raise my children to communicate with anyone, anywhere in the world." But while Spanish may be tied to traditions or heritage, it's also subject to family dynamics. "Sometimes parents only use Spanish to scold or yell at their children or when they are expressing extreme emotions," said Carter, noting that students often tell him Spanish "is the language my mom yelled at me in." He added: "That leaves some kids in a state of emotional whiplash." And when children associate Spanish with negative experiences, they may be less likely to use the language. Spanish use also varies on the opportunity and willingness to use it outside of the home. "Some people like me may speak only English at home but Spanish at work," said Mark Hugo Lopez, director of Hispanic research at Pew. "When I was growing up, speaking Spanish was something that people didn't do. People were trying to run away from all those things that were Mexican. That's changed now," he added. Experts have found numerous advantages to bilingualism. It has neurological benefits, stimulating synapses in the brain like music and aiding in attention and task-switching abilities. Plus, there are educational advantages. A Michigan State University study in Texas found that English-speaking children in bilingual programs did better on state math and reading tests than their English-speaking counterparts without those programs. There’s also evidence bilingualism increases economic competitiveness. A University of Florida study found that fully bilingual Floridian Hispanics earn $7,000 more each year than their monolingual, English-speaking counterparts. Given these advantages, schools around the country have invested in bilingual education methods. Dual-language programs have exploded in the U.S., growing from 260 programs in 2000 to around 2,500 in 2014. And it's programs like these that could help future generations of Latinos keep their language alive. Chad Ransom, second-language services director for Teton County School District No. 1 in Jackson Hole, WY., helped launch a Spanish and English dual-language program in 2009 which now serves nearly 500 students from kindergarten to seventh grade. The idea was not only to close the achievement gap between native Spanish-speaking students and English-speaking students, but his research found that dual-language immersion is the "most effective program model for English-speaking students to be most successful in English." Every year, the program receives double the amount of applicants than it can accept, so Ransom plans to expand. The results are clear: native English speakers perform equally or better than their peers outside the program on standardized tests, while native Spanish speakers close the gap by fifth grade, scoring around the 50th percentile nationally. The outcomes go beyond exams: one teacher observed that the dual-language students work together better than their counterparts outside the program, who are more likely to separate into cliques. Ransom notes that the program also aims to make children successful once they finish school. "I think that you're more economically competitive in a global society," he said. Being bilingual - and biliterate - can indeed pay off later in life. Lissette Calveiro, 23, of Miami, Fl. grew up speaking Spanish at home with her mother and half-sister, Ecuadorian immigrants, and her father, a Cuban immigrant. At school and with peers, she spoke English, and with Latino friends, Spanglish. She says she dreams in English. Being bilingual has both practical and personal benefits. "It helps me connect with my parents' heritage," said Calveiro. Living in Miami, one of the country's most bilingual cities, she's able to give directions in Spanish and help English-speaking tourists. And working in public relations she's also had more opportunities, including doing TV spots, since she can speak and write in Spanish. "Being bilingual is a commodity in the professional world," she said. "It really helped me stand out." Despite the benefits involved with bilingualism, the use of Spanish in the U.S. is often a political landmine, from English-only laws to California's Proposition 227, a ballot initiative in 1998 which largely eliminated bilingual classes in public schools. Politics don't just impact laws affecting education - the political climate can affect how Latinos perceive language, says Carter. "If you watch the presidential election cycle, a child need only receive one message that Spanish should be walled out of the country or Spanish should be not used by politicians or Spanish should not be spoken in public," he said. "Those types of messages reinforce the idea that it's a bad language or a language not worth knowing." And that's a particular risk this election year. In November, a group of prominent Latino intellectuals penned a letter to condemn Trump, saying: "The physical aggressions against Hispanics and repeated calls to prohibit the public use of the Spanish language have already started.” And last month, Univision anchor María Elena Salinas was booed during a commencement speech at California State Fullerton when she briefly spoke Spanish. But not everyone agrees with Trump. Californians will vote again on Prop 227 in November - this time, on whether to repeal it.